The Long Range is used to find buried objects at long distances. By using cross pinpointing the exact position of the located object can be determined. The Bionic 01 is a long range gold locator which is mainly be used to detect gold and silver targets. The gold detector Bionic 01 can be used for many detecting tasks. Gold detection, silver detection and treasure hunting in high distances are the main purposes of this gold detector. The long range system can find natural gold targets like nuggets or gold veins but also buried gold objects like jewelry, ornaments, gold or silver statues, gold rings or gold and silver coins. The gold long range detector can also be used for research of gold nuggets in riverbeds and near the coast. The gold detector can also locate successfully gold in the mountains, in forests, jungles and deserts. The gold finder Bionic 01 works not only in dry ground, it is also suitable for humid places, wet soils and can be used after rainy days without any difficulties. This gold detector is very sensitive to changes of the ionic and magnetic field of the surrounding area, that is why this gold and silver detector has the best performance in areas with less population and less constructions and buildings and is most accurate in nature environments. So it can be calibrated to the natural proximity in the most optimal way and recognize anomalies where possible gold discoveries can be situated. The Bionic 01 is specially used for a fast research for gold and silver, to explore new areas where hidden treasures can be situated. It can be used for a first examination of unknown terrain to find interesting places of buried treasures, so it is advisable for gold hunters who don’t have any clue where to start detecting. The gold seeker can easily and quickly get a general overview about large areas. This long range technology is specially designed for areas where it is impossible to walk. Reasons can be accrued forests, rocky mountains or rock faces. By pointing the gold detector Bionic 01 in different directions and moving it along the horizon from left to the right side or vice versa, the gold searcher can detect the direction where buried gold or silver objects are situated. The gold finder immediately gives an acoustical signal and a message on the display when pointing in the direction of a gold/silver object. If calibrated in the correct way the Bionic 01 does only react on gold and silver objects, it does not indicate ferrous metal or any other kind of metallic objects, neither cavities. When a positive signal has been obtained, this distance scanning procedure should be repeated in the same direction from another position (for example the gold hunter can walk 50 meters to the left or right side). At the place where both measurements cross each other, a possible buried gold or silver discovery can be suspected. This procedure is called cross pinpointing. This drawing shows the cross pin pointing with gold detector Bionic 01. The first measurement is done at position A. If a positive signal is obtained the scanning procedure needs to be repeated at position B, which is about 25 – 50 m away from the first position. If another positive signal is present, the gold find is situated where the two directions of positive signals cross each other. The bio-energy system interacts with the bio energy of your own body during the localization of gold and silver objects to observe minimum changes of object substances. 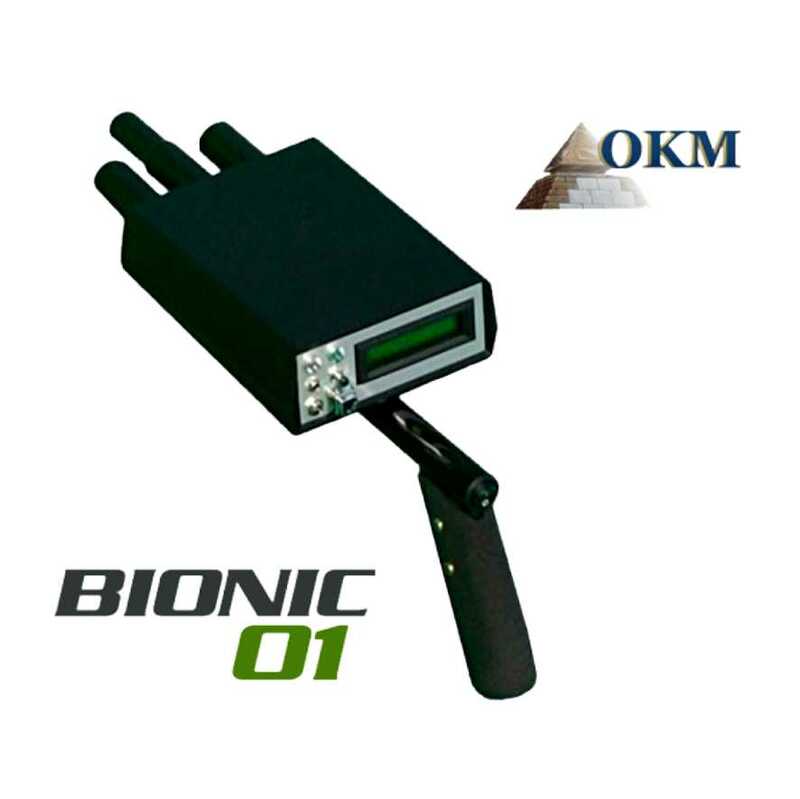 Thereby the gold detector Bionic 01 is able to locate almost all metallic objects whereas the ionization system is a method to measure the ions radiation (ions absorbance). Therefore a metal-ion reaction chamber is integrated in the Bionic 01. The bio-energy system is able to locate also fresh buried or not buried objects no matter which age they are. The ionic system is mainly used to find buried artefacts.